Welcome, readers, to the virtual home of Jane Seville Books! Enjoy the holidays with Jack and D! Don't miss out on my holiday novella featuring Jack and D! 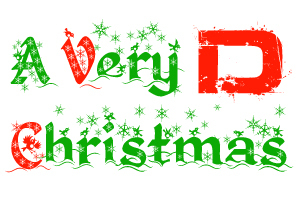 Last year, sales of "A Very D Christmas" raised over $200 for The Trevor Project, a support organization and suicide-prevention hotline for GLBTQ youth. But you can still share Christmas with Jack and D.
At Jack's urging, D reaches out to his sister, who he has not seen in thirteen years. When the pair journey to Indianapolis to spend Christmas Eve with Merle and her family, will an ex-hitman learn the true meaning of Christmas? Or just get drunk on eggnog? I hope you enjoy this little family-themed holiday story. If you would like to leave a comment about the story or about...well, anything at all, please do so at this post at my blog.